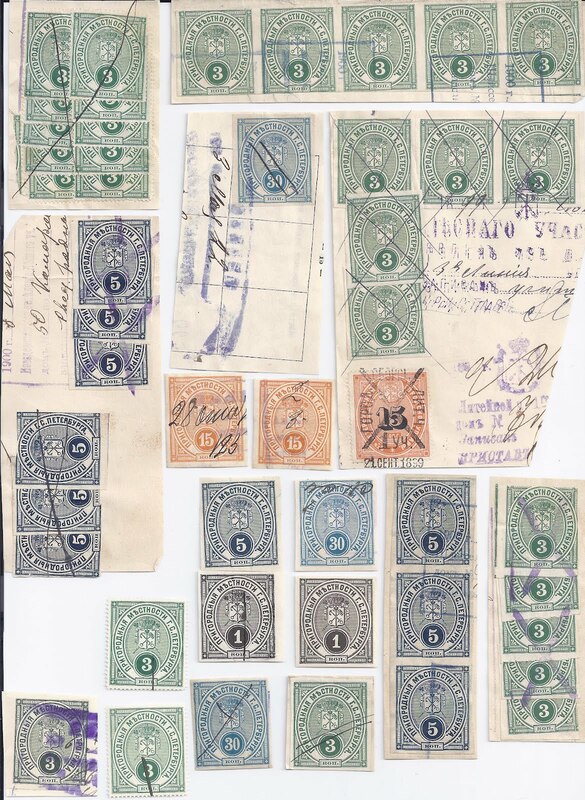 Trevor Pateman's Philately Blog: St Petersburg / Petrograd Prigorod Fiscals: a Correction! St Petersburg / Petrograd Prigorod Fiscals: a Correction! I have removed two of my Posts about these Fiscals.I got things wrong.This is partly because I was only looking for one thing and partly because there is a confusion in the Barefoot Russia Revenues catalogue. Above is my current stockbook holding of the Fiscals in question. All are inscribed S. PETERBURGA on the right, except for one 3 kop imperforate stamp stamp (bottom left) which is inscribed PETROGRADA. In the Barefoot catalogue, page 76, the Petrograd issue is not listed. It looks like some text got left out. Before the listing of numbers 21 - 24 there needs to be a line identifying these stamps as Imperforate and inscribed Petrograd. But in the catalogue, 21 - 24 are included with the perforated stamps of 1901 inscribed St Petersburg. As a result, I only looked at the left hand side of my stamps, looking for the plate error Reversed "I" in "PRIGOROD.." which means that the Cyrillic "I" looks like a Roman "N". I found examples on the 3 kop and 15 kop imperforate. But Barefoot lists them only on the perforated stamps (21a, 23a) and not on the imperforate issue of 1883. So I thought I had found something new. What I failed to notice was that my stamps were inscribed Petrograd not St Petersburg and it is on the Petrograd - inscribed issue that one should be looking for this known plate variety. Thanks Trevor. I've corrected our draft new edition, including renumbering this section. The reversed letter probably was once per sheet, and certainly comes on the IMPERF series of 1883. Now, a question : by the time these stamps got to be perforated in 1901, had the printers corrected the error? Or, is this letter error also found on the 1901 perforated stamps? And, another question : I have not had reports of a 1k or a 25k existing as a perforated stamp? Had these two values been withdrawen by 1901, or do they indeed exist perforated? Any additions or corrections from readers?